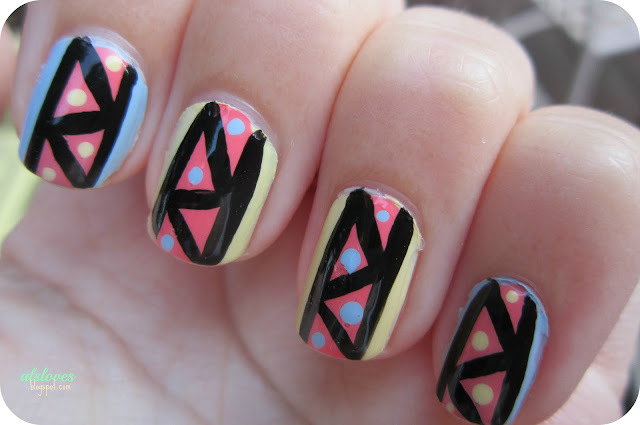 Al's Loves: Nail Art Fever! I think I was going through a bit of a funk and only painting my nails one solid colour. But the urge has suddenly sprung up again. It first started with MissJenFabulous on youtube and her fishtail braid nail tutorial which I tried but it was a little messy, but still fun and posted a picture on Instagram: "click"
But then I found thekatizzzle on Instagram and had to try these nails. (you should totally watch her videos / read her blog I had a mini marathon after I found her.) Anyways this is what I came up with. Its pretty easy, especially if you have many colours of one shade, just paint the base white and with a dotting tool or toothpick create a diagonal line of dots! Then since I'm still kind of into the tribal trend and most tribal nail art is impossible to do I did this little number. Just paint your nails the base colour, I chose yellow and blue. Then pick the colour you want in the middle I chose coral. And with a black striper I made the two lines at the edges of the coral and then made the zigzags. To finish it off. I used the opposite base colour with a dotting tool in and spaces and topped it off with a top coat! The colours I used were Joe Fresh: Butter, Powder Blue and Coral. And the L.A. Colors Nail Deco in black.